"This is not just any baby," says Bobby Schopler, a veterinarian at the Duke Lemur Center since 2005. "This is the most important birth in the 13 years I've worked here." Baby Ranomasina is the third blue-eyed black lemur—one of the 25 most endangered primates in the world—born at the center this season, which brings the total number of her kind in North America to 34. But she is also considered among the most "genetically valuable," since she is the offspring of the first lemurs imported from Madagascar to the U.S. in 24 years. Ranomasina is also unusual because she was delivered via cesarean section, a surgery so rare that since the Duke Lemur Center's founding in 1966, C-sections have been performed only 15 times. 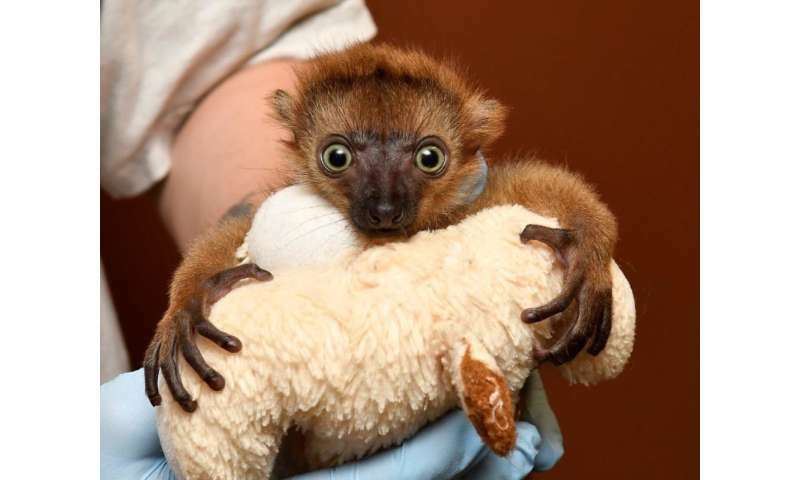 "She's the most important offspring from one of the rarest lemur species," Schopler said. "She was born to a pair that took us three years to bring to Durham from Madagascar, and we may never be able to import anymore." In fact, Ranomasina is genetically so valuable to the population of these critically endangered lemurs that when she was discovered in breech position, veterinarians resolved to perform a rare C-section rather than risk a difficult—and potentially fatal—birth. The infant, whose name means "sea" in Malagasy, is the first offspring of Mangamaso and Velona, blue-eyed black lemurs brought from Madagascar to the Duke Lemur Center in 2017. Until Ranomasina's birth, every blue-eyed black lemur infant born in North America had descended from just seven wild-born individuals imported by the Duke Lemur Center in 1985 and 1990. 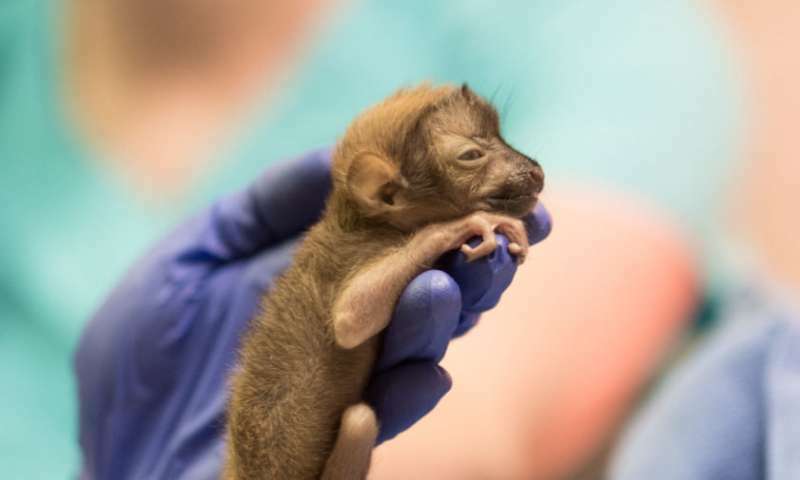 "With the birth of Ranomasina, for the first time since 1990, we have a whole new lineage of blue-eyed black lemurs coming into the North American population," said Cathy Williams, curator of animals at the Duke Lemur Center. While the current captive population is healthy, new genetically unrelated individuals like Ranomasina are critical to grow and sustain it. "The more genetically diverse a population is, the more resilient it is, the healthier it is, and the better it can adapt to environmental pressures," Williams said. But as crucial as she is to the genetic health and long-term survival of her species, Ranomasina's own survival was initially uncertain. Two weeks before her due date, Velona was evaluated by the Lemur Center's veterinary team, who discovered the infant was in breech position. 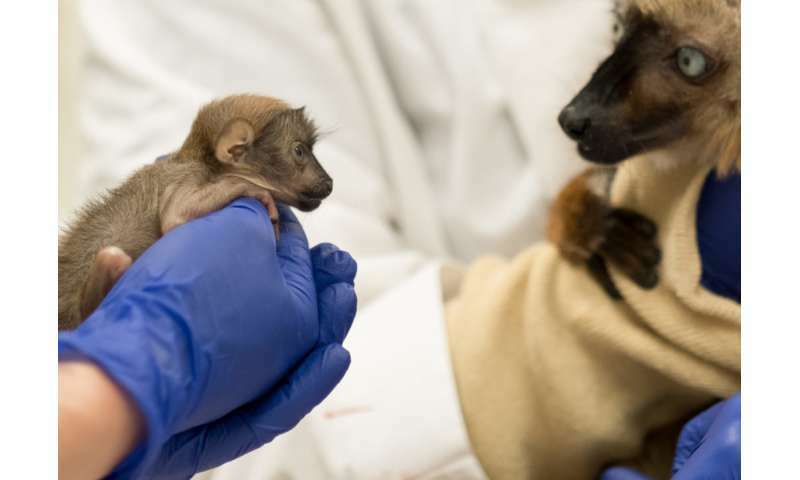 "There isn't a lot of data regarding breech births in lemurs," said center veterinarian Laura Ellsaesser. "In humans, babies in breech position are a concern because they are more likely to become stuck in the birth canal, which can become life-threatening to both the baby and the mom." "Sometimes in humans, a breech baby does flip and do just fine," Ellsaesser said. "But in lemurs, we just don't know; so we put Velona on a much more aggressive baby watch." David Watts, a researcher using concealed cameras to study maternal behavior in aye-ayes, contributed some of his equipment to the cause. "Using David's cameras meant that we didn't disturb her," Ellsaesser said. "We could watch and, if we saw signs she was having a difficult labor, we could intervene." Duke Lemur Center husbandry and veterinary staff watched round-the-clock, but Velona showed no signs of labor. At 130 days' gestation—past her expected delivery date—Ellsaesser and Schopler did an ultrasound. The infant was alive but still breech. "We knew from thirty years of data that any blue-eyed black lemur infants born after 130 days' gestation were stillborn," Schopler said. "We were torn between not wanting to do a C-section on a first-time mom, versus possibly losing the baby and the mom in a difficult birth. Ultimately we decided that, all things considered, the lower risk was to deliver the infant via C-section." "She fell asleep without a baby and woke up with one," said Schopler, who spent the night in the veterinary office to monitor Velona's behavior toward the infant. Velona's recognizing and accepting the baby would be crucial to Ranomasina's survival. If her mother didn't bond with her, she could have attacked and damaged the tiny infant. "Baby season is fun, but it's stressful too," said Duke Lemur Center primate technician Becca Newton, Velona's primary caretaker. "Those first days were critical. A lot could've happened, especially since Velona was a first-time mom." "Even though it took a while, Velona formed a tight motherly bond with her baby," Newton said. "Once it was there, it was there. She's been a good mom. I'm very pleased, very proud of her." Now over a month old, Ranomasina is thriving. Her dad Mangamaso has been successfully reintroduced to the family group, and the infant has begun nibbling solid food and venturing tentatively away from Velona—though never far from the safety of mom. "This female infant has a huge responsibility in front of her," Schopler said, but for the next 2.5 years she'll grow and learn from her mother before being paired with a male to start a family of her own. "It's really exciting for the staff to be part of this," Williams said. "It reinforces why we work here and why we're so committed to what we do. We're part of something much larger. Saving these animals is our contribution to making the world a better place for future generations."